Senate Kills Rule On Class-Action Suits Against Financial Companies : The Two-Way The rule, released by the Consumer Financial Protection Bureau in July, was aimed at "forced arbitration" clauses in consumer agreements with banks and credit card companies. Updated at 4:12 p.m. ET. The Senate has voted to get rid of a banking rule that allows consumers to bring class-action lawsuits against banks and credit card companies to resolve financial disputes. Critics say Republicans and the Trump administration are siding with Wall Street over Main Street and that the shift will block consumers from joining together against the likes of Wells Fargo and Equifax. "This bill is a giant wet kiss to Wall Street," Sen. Elizabeth Warren, D-Mass., said on the Senate floor. "Bank lobbyists are crawling all over this place begging Congress to vote and make it easier for them to cheat their customers." 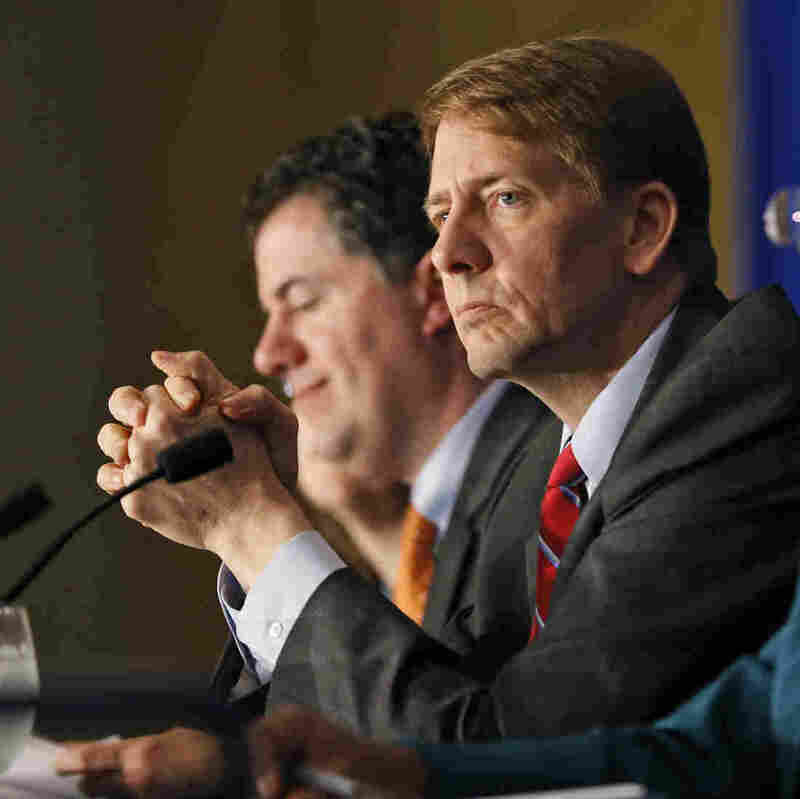 The consumer agency's rule, released in July, was aimed at giving consumers more power. Prior to the rule, the bureau said companies could "sidestep the court system" by "forcing consumers to give up or go it alone." This allowed companies to "avoid big refunds, and continue harmful practices," the bureau wrote in July in announcing the changes. The agency said it was redressing a situation in which consumers were forced "to give up or go it alone — usually over small amounts," while companies were able to "sidestep the court system, avoid big refunds, and continue harmful practices." In a statement released shortly after the vote, bureau Director Richard Cordray said it represented "a giant setback for every consumer in this country. Wall Street won and ordinary people lost." White House press secretary Sarah Huckabee Sanders said Trump supported the move because "the rule would harm our community banks and credit unions by opening the door to frivolous lawsuits by special interest trial lawyers." Democrats argue that such rules give consumers more power to stop abusive practices. "It looks like Equifax and Wall Street and Wells Fargo will win again," said Sen. Sherrod Brown, D-Ohio. "This vote will make the rich richer; it will make the more powerful more powerful." Republicans said class-action lawsuits give a lot of money to trial lawyers and don't do that much to help consumers. "You have to ask the question: Whose benefit is that for? Is it really for the consumer or is it for the lawyers? And I think the answer is pretty clear — it's not for the consumer," Republican Sen. John Cornyn of Texas said. But a report by the consumer agency showed that class actions paid out about 1,000 times more money to consumers overall than consumers got through arbitration. Dennis Kelleher, the president of the consumer group Better Markets, says that at issue is what's buried in the fine print when you sign up for a credit card or many other products. "They're usually 10-50 pages long of teeny-weeny print, and in the middle of it it says you're giving up your right to sue when the bank or the financial institution rips you off," Kelleher says. The Senate's action means that "millions of Americans won't get their day in court," says Lauren Saunders, associate director at the National Consumer Law Center. "To me, I'm just really disappointed about the lack of faith in our constitutional system of justice."